Cloture vote on @JusticeWillett was 50-48, moves on to confirmation. There is no reason for that level of hostility to this nomination of a well-qualified candidate except pure partisan spite. Democrats should be ashamed of themselves. If you look at the final roll call vote, not a single Democrat voted in favor of Willett's nomination. Embarrassing. That list includes "moderates" like Joe Manchin from West Virginia, Joe Donnelley from Indiana, Heidi Heitkamp from North Dakota, Jon Tester from Montana, Claire McCaskill from Missouri, and the rest of them. Each of the five I just name-checked are running for re-election next year in states carried heavily by Trump. They all claim to be independent from their left-wing party, and profess a desire to work across party lines, even with the president. And yet they were reliable votes in favor of all of President Obama's liberal nominees, whereas they routinely salute Chuck Schumer and vote 'no' on Trump's picks. They pretend to be pro-second amendment politicians, then they vote against judges who'd uphold the right to bear arms, having rubber-stamped jurists who wouldn't. Recall that modern Second Amendment jurisprudence hangs by a 5-4 thread, despite the clear wording of the Constitution. Swing voters in those red states must be made aware of these votes, and it's up to Republicans to prosecute the case. Senate Republicans are set to confirm three more of President Donald Trump’s appeals court picks this week, a push that will help set a record for the most such appointments in a president’s first year in office. The Senate is expected to confirm Steve Grasz for the U.S. Court of Appeals for the 8th Circuit, and James Ho and Don Willett for the U.S. Court of Appeals for the 5th Circuit, over the objections of Democrats who question whether they can be unbiased. That would mean at least a dozen Trump appointees would join the nation’s appeals courts — which have the last word in all but the 100 or so cases that the Supreme Court decides each year — in his first year in the White House. That comes in a year the Senate also confirmed Supreme Court Justice Neil Gorsuch in April. Compare that to Barack Obama, who successfully appointed three appeals court judges in his first year in office in 2009, as well as Justice Sonia Sotomayor. Obama followed up with 13 appeals court appointments in his second year in 2010...There are currently 17 vacancies on the nation’s 13 appeals courts, with seven nominees pending, according to the Administrative Office of the U.S. Courts. The pace over the last two months has been deliberate and fast compared to the recent past. This week is the second that McConnell, amid pressure from outside conservative groups, dedicated an entire week of floor time to a series of votes to overcome Democratic filibusters on the nominees. That piece was published earlier in the week. Since then, Grasz and Willett have been approved, and cloture has been invoked on Ho, with confirmation pending. Harry Reid's Democrats changed the game when they nuked the obstructionist tactic they'd pioneered during the Bush years (their excuses fail), then mounted an unprecedented partisan filibuster of a Supreme Court nominee. 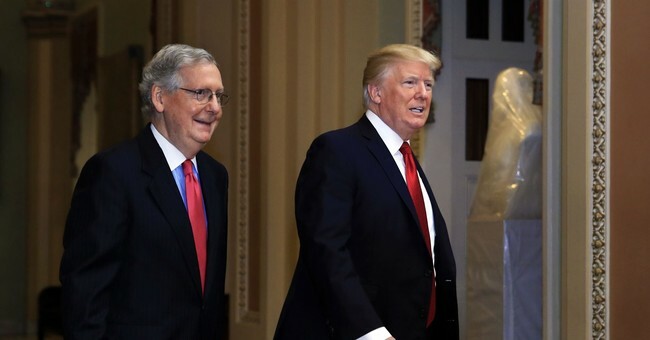 They paved the way for Trump and McConnell's breakneck confirmation clip -- with more work to be accomplished.